Note: If you are flying out or pick up arriving passengers, these airlines use the South Terminal: Aerolineas Argentinas, Air Canada, Air France, Alitalia, Avianca, Carribbean, Copa, Delta/Com Air, LAN, LTU, Lufthansa, Swiss, United (TED), US Air, TACA, and TAM. Up to 3 hrs - $18; overnight (24 hours) $30; each add'l day - $30. up to daily max - $30. 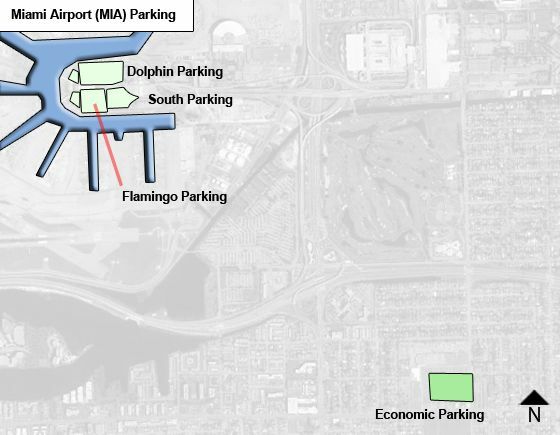 Long Term Parking: The (a) Dolphin Garage serves the North Terminal (Concourses C, D, and E), and (b) the Flamingo Garage serves the South Terminal (Concourses F, G, H and J) and can be accessed on the arrivals or departure levels of the airport. The main entrance to both garages is off Central Boulevard; keep left as you approach the terminal. Daily max (24 hrs) - $15. Daily max (24 hrs) - $8. Directions to Economy Park & Ride: When entering from Central Boulevard, drive all the way through the departure level as if you were going to exit the airport. Then take Exit 5 and follow the signs that say: �Economy Park and Ride�. When entering from Perimeter Road take Perimeter Road to Northwest 14th Street. Disabled Parking: Designated disabled permit parking and stroller permit parking is located by the moving sidewalks on the 3rd level of the garages. Additional disabled permit parking is available for wheelchair accessible vehicles on the ground level, at the easternmost section of the Dolphin garage. For more parking information, contact the Parking Facility Manager � J.M. Denis at 305-876-7598. Evenings and weekends please call 305-876-7536.